A motor vehicle mechanic was fatally injured when a vehicle fell from a two-post hoist after the horizontal locking mechanisms failed to lock the vehicle hoist support arms in place. A threaded rod-pin mechanism used in the horizontal locks of the two-post hoist had been lubricated with heavy grease. The grease was contaminated by debris, which prevented the pin from properly engaging and locking on the rod. The victim was working underneath a raised vehicle when the passenger side lifting point on the rocker panel of the car became unstable. This created a horizontal force on the front and rear lifting points on the driver’s side. Neither of the horizontal locks on the driver’s side hoist support arms were working properly because of grease and debris build up. The vehicle hoist support arms moved outward and the vehicle fell to the floor, trapping the victim beneath it. In plunger-type horizontal locks, a buildup of grease and debris can prevent the plunger from properly dropping and fully engaging, resulting in increased risk. Employers must have a hoisting apparatus inspected every 12 months by a competent person. Inspections must, at minimum, be carried out according to the manufacturer’s specifications and ensure all locking mechanisms are clean and work properly. Operators must inspect hoists before use to verify safe working order. Ensure warning labels, rated load capacity and safety tips are accessible and readable. Check operating controls, restraints and locking devices for malfunction. Check structural components, hoses, electrical wires, drive chains, cables and screws for excessive wear or deformation. 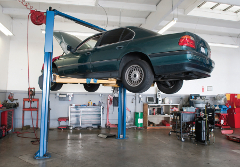 Check contact points that engage vehicles during lifts for damage or excessive wear. Check reservoirs for correct oil levels and for hydraulic or pneumatic leaks. Check for any unusual noise, sudden movements, erratic operation or evidence of chips or filings during use. Check for cracks, breakage or loose concrete around floor anchor bolts. Employees are responsible for reporting deficiencies to their employer, who must ensure they are corrected before use. All inspections and repairs must be recorded, and made available to an officer upon request. Operators must ensure lifting pads are placed properly beneath the vehicle in accordance with the vehicle’s manufacturer’s directions. Hoisting Apparatus Inspection Guidelines are available through WorkSafeNB.